Welcome to Oxford Lakes Dental Care, located in Oxford, MI. At our comprehensive dental practice, we focus on providing our patients with conservative dental treatments that create beautiful, radiant smiles. Our modern dental office is equipped with the latest dental technology, including dental lasers, CEREC same-day technology, digital X-rays, VELscope, and DIAGNOdent, in order to keep our patients safe and healthy. We also offer services such as dental implants, teeth whitening, mercury-free fillings, and pediatric care to ensure that all of our patients have a healthy, beautiful smile. When you visit the office, the warm environment as well as our caring, friendly staff, including husband and wife dentists Dr. Daniel Sahutske and Dr. Donna Sahutske, is guaranteed to leave you with a smile on your face! Oxford Lakes Dental Care has been providing comprehensive family dental care to patients in Oxford and the surrounding areas, including Lake Orion, Metamora, Lapeer, Clarkston, Leonard, and Brandon, since 1998. If you are interested in receiving proactive dental care that focuses on creating beautiful, healthy smiles, we invite you to contact our dental office today. 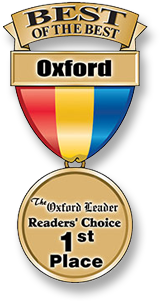 We have been voted Best of the Best Dental Practice every year since 2010. We look forward to taking care of all your dental needs. 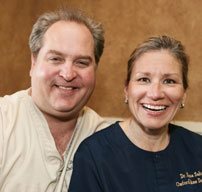 We are Dr. Donna and Dr. Dan Sahutske and since graduating Marquette University School of Dentistry in 1987, we have been offering superlative dental care long enough to know a thing or two about how to get it done right! Our mission and the reason we show up at our office every day is to make a positive impact on as many lives as possible.